Summer is a great time to switch up your style and experiment with new looks while on summer break! Trying new curling or braiding techniques, a fresh haircut, or even some fun color can be super energizing for your summer boredom bouts too. 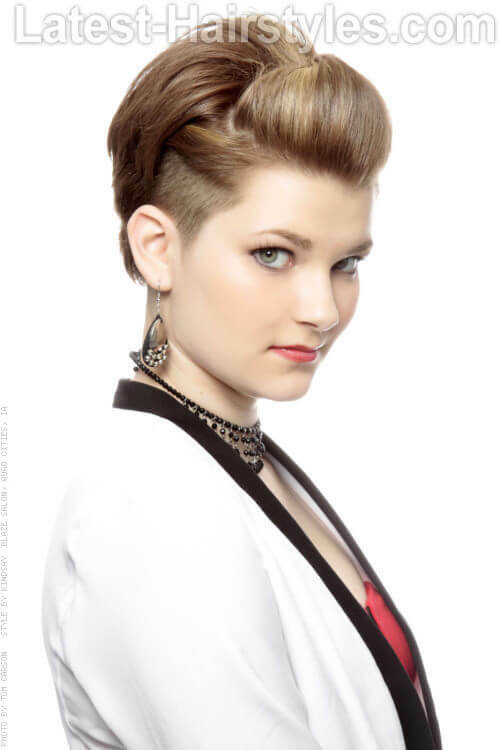 Draw inspiration for this season’s ‘do from these hot teen hairstyles for summer! Long hair can really get in the way when going out on a boat, while playing summer sports, or an especially hot day! Upgrade your basic ponytail and try this easy alternative. Starting with dry hair, mist a texture spray though out. I like Pravana’s Beach Wave Spray, brush to ensure even application. Choose a part and sweep fringe off to the side. Gather hair to one side, separate into three equal parts. Begin creating a three-strand braid while holding hair up towards the top of your head. When you reach the ends, secure with a clear elastic band. Wrap braid up and over the top of your head and around the back. Tuck ends under to hide them and secure braid with bobby pins. This is a great second day hairstyle too! Start off by spraying your roots with a dry shampoo. My favorite for volume and texture is Pravana’s Fresh dry shampoo. Any face shape can wear this Dutch braid and swept fringe look, while hair that is longer (past your shoulders) and straight to wavy will make it easy to achieve this braid. To give this style a more “lived in look”, before you wrap your braid around your head, rough it up a bit. Gently pull on small pieces to loosen and create texture. Adding some interest to beautiful curls changes this look up and is perfect for a summer wedding, night out, or your senior pictures! Starting with damp hair, apply a styling cream. Comb through to ensure it covers every strand. Blow dry hair using a round or paddle brush. Once hair is completely dry, flip on your 1½-inch curling iron or curling wand. Curl hair in medium sections, directing curls towards your face. Create a section in front. Fashion a “bump” in the fringe area. Secure with bobby pins in an “X” pattern. Here’s the part that will possibly take some practice. Taking ends of first section, add hair along the hairline and create a loop pattern. Secure with bobby pins, hiding in hair. Keep moving down hairline towards the ear, continuing this looping pattern. Finish with a great hairspray and get ready to enjoy your night! Choosing a hairspray when wanting a soft look can prove to be a challenge. Try Pravana’s Super Shape Hairspray. Mist over your finished look for a soft hold, or layer for more hold and control. Any beautiful face shape can wear this soft curly style and hair that is medium in texture and wavy or straight can easily achieve this style. Practice makes perfect! Don’t worry if it takes you more than once (or ten times) to get your loops to look great. If your hair doesn’t want to play nice, take a break and come back to it! This is a fun look that can be worn anywhere from the beach to a night out! Carefree beachy waves paired with volume and braids is hot, hot, HOT. After washing and conditioning your hair, apply a sea salt spray throughout your entire head. Scrunch hair to encourage waves. Using a diffuser, blow dry hair using the lowest setting on your dryer. Create a middle section that will be your Mohawk. Next, section sides into three sections that will be braided. Starting at top side section, French braid hair going back towards the center of your head. Continue through all three sections, securing with clear elastics at ends. Moving to the bottom back section, gather and lift hair up off of your neck and give it a slight twist. Secure this section with bobby pins in an “X” pattern. Lift top Mohawk section and back comb until desired height is achieved. Secure with bobby pins and spray with hairspray to finish. Resort Spray from Kevin Murphy has to be my favorite sea salt spray. It smells amazing and creates the perfect grit and texture to hair! Diamond, oval and heart face shapes wear this look best, while hair that is medium to fine in texture and naturally wavy make it easy to rock this look. If your hair is not naturally wavy, use a medium curling wand to wind hair and create perfect beach waves. Who doesn’t love a head full of beautiful curls? Always in style, this classic look brings fun and flirty vibe to any summer outfit. Before blow drying damp hair, apply a volumizing mousse . Comb through to ensure product is equally distributed. Blow dry hair using a medium round brush. To create bouncy curls you have two different options: hot rollers or a curling iron. When using hot rollers or a curling iron (1-inch), starting with the sections underneath, take a two inch section and secure the rest of your hair up. Wrap hair around iron or curler in a pattern of one towards the face, the next away from your face. Continue bringing down two inch sections and following that pattern. Let all curls and/or rollers cool completely before manipulating curls. Once curls have cooled, remove any rollers carefully and apply a small amount of shine serum in hands. Rake fingers through curls to break them up and give some volume. Mist with your favorite hairspray to finish. A fabulous volumizing mousse is Pravana’s NEVO Full Volume Mousse. It’s lightweight, smells amazing, and best of all it gives body and bounce with no stickiness! Looking for great shine serum that repairs your hair at the same time? NEVO Hydra Pearls is so just that! For even more volume, when you go to loosen the curls up, flip your head upside down before you start and enjoy big, beautiful hair all night! This curly style is a great way to get your hair up and off your shoulders for a fun night out, wedding, or even a day at work! Starting with dry hair, apply a texturizing cream or gel. Comb through to ensure it’s evenly distributed throughout. Blow dry hair for just a minute or two to activate product. Using a 1-inch curling iron or curling wand, begin curling hair from underneath, securing the top section of hair up and out of the way. Continue through all sections of hair. Let curls cool before manipulating. Starting in the front, create a small section and twist it slightly back. Pin that section, letting the ends stay loose. Gather the very top section of hair that will NOT be incorporated into braids and secure it with a clip. Beginning in the center back of hair, create a section and begin French braiding up the back of the head towards the top. Secure with small clear elastic band at the top of the head, leaving the ends loose. Continue sectioning and braiding through the back and sides of hair. Arrange loose ends of hair to hide elastic bands and bobby pins. Finish with a great hairspray, creating two layers if necessary. I love to start a look like this with Kevin Murphy’s Hair Resort Lotion. It provides great texture and hold and never gets flaky! Heart, oval, and diamond shaped faces wear this style like it’s made for them, while hair that is medium to thick gives a great base to create this curly look. If you want to switch this look up a bit, try small twists instead of braids. You can also dress it up by adding a sparkly headband, clip or pins! 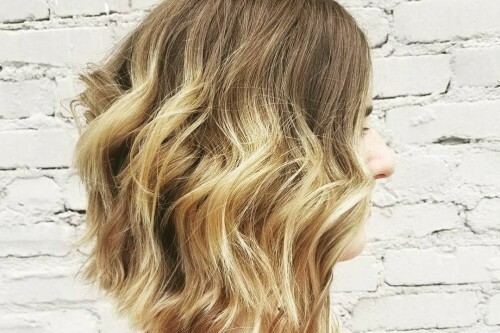 Look like you just stepped out of the ocean with these perfectly imperfect waves! These are great for any summer occasion. Apply a sea salt spray to damp hair. Rough dry using just your fingers. Once dry, use a fun “bubble wand” curling iron to curl your hair. Section hair into three sections — each side and back. Secure with clips. Bring down a 1½ to 2-inch section and separate into 2-inch pieces to curl. You can wrap hair around the bubble wand or use the clip to hold it in place. Continue bringing sections down and curling. When curling the hair around your face, make sure to switch between directing curls towards your face and away from your face. Let all curls cool completely before misting lightly with sea salt spray and shaking your head to break curls up. If you need to you can also use your fingers. Just be sure not to pull the waves out. Smooth fringe with a flat iron if needed. Clip in a flower and you are ready to go! Verge by ONE Styling has a fabulous “Bubble Wand” that I use in the salon to create these amazing waves. Search for a salon near you that carries them, or check out your favorite beauty supply for other similar irons. Any face shape can wear these fabulous waves, while hair that is wavy to straight and medium to thick in texture make this style easy to achieve. If you can’t get your hands on a bubble wand, use a large curling wand or curling iron. Just wrap hair around the barrel without using the clip. Effortless soft waves with a simple braid create a perfect look for this summer. The bonus? It’s super easy to achieve, although no one will ever believe it with how fabulous it looks! Starting with damp hair, apply a medium hold mousse. Comb through hair to make sure all strands are covered. Blow dry hair using a large round brush. Once hair is completely dry, heat up your 1½-inch curling iron. Section hair into three sections — each side and the back. Secure each section with clips. Bring large sections down and create two to three-inch sections to curl. Start curls three to four inches away from the scalp. Hold hair on curling iron until you can feel the heat through the large section. Drop down curl and let cool completely. Continue curling through entire head, letting all curls cool. Create a section in the top front of hair on each side of part and braid through ends. Secure with a clear elastic band. A great mousse for this look is Kevin Murphy’s Body Builder. It gives soft hold and volume. Any face shape can wear this soft look! Hair that is thicker and holds a curl or wave well will help to keep this look going all day (and night!). Make sure not to braid too tight. You want it to hold and stay, but still flow with the soft waves. If it seems too tight, gently pull on it to loosen starting near the ends. This look gives a lot of volume with a fun edge. Whoever said you are limited on styles with short hair didn’t see this one coming! While hair is damp, apply a volumizing mousse. Blow dry hair with a medium round brush through top. Once hair is completely dry, apply a volumizing powder to scalp area through entire top. Back comb if necessary. Smooth out front section and gather in middle, push slightly forward to give a little more height and secure with bobby pins in an “X” pattern. Volumizing powders amaze me! My favorite is Pravana’s NEVO Lived In Powder Potion. It starts as a powder, transforms into a gel, then goes back to a powder! It gives texture and volume without feeling like anything is in your hair. Amazing! 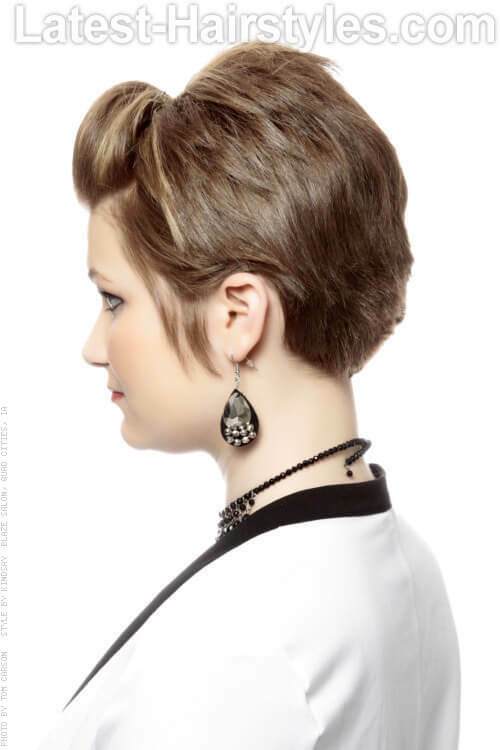 Round, heart and oval face shapes work best with this undercut hair style. 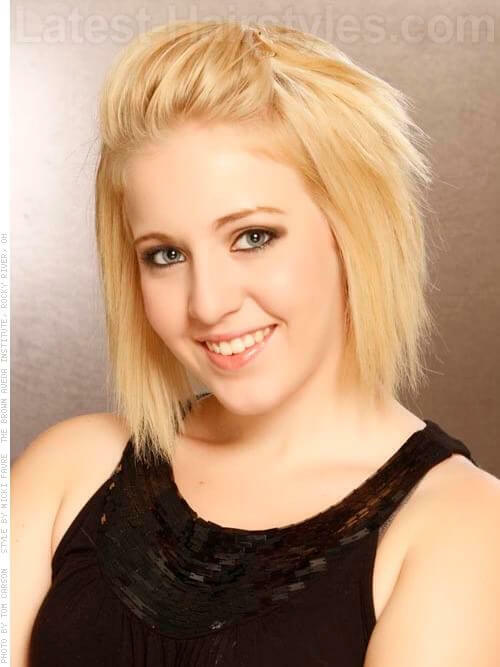 Hair that is straight works best to create this volumized look. 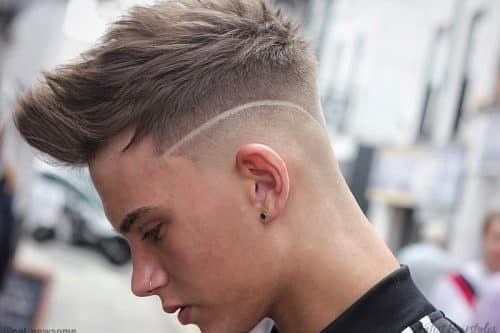 Even if your hair is not undercut, you can fake it! Just slick back the side and pin it in tight. Beautiful curls swept off to the side can be worn for a wedding, night out, or any occasion this summer. It’s fun, young, and easy to accomplish! Apply a medium hold gel or mousse to damp hair. Blow dry directing one side back and off to the side with a paddle brush. Using a 1-inch curling iron, curl hair directing toward the side that hair will be swept to. Let each curl cool completely before handling. Arrange curls off to the side and mist with your favorite hairspray. Use bobby pins to hold hair over to side if needed. You want your curls to stay, but you also don’t want them to get weighted down. The hairspray you choose can make a huge difference. Try Pravana’s Super Shape Hairspray! A little goes a long way and you can layer for more hold. Round, oval and heart shaped faces wear this style beautifully, while hair that is medium in texture and straight will make this style easy to achieve. 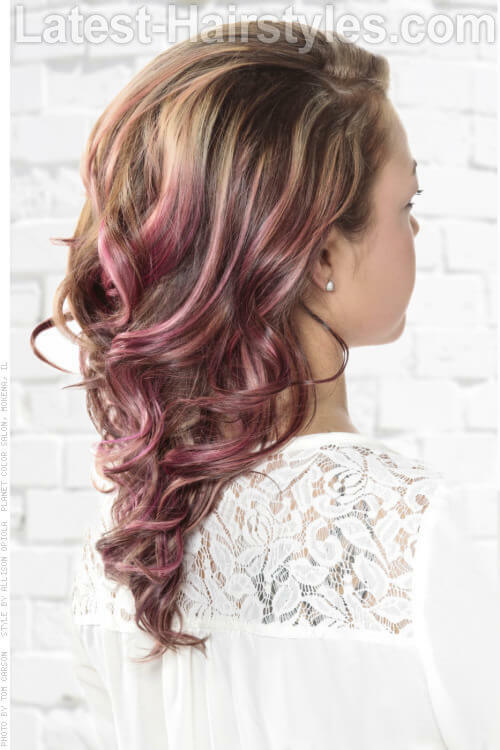 Love the soft pink through her highlights? 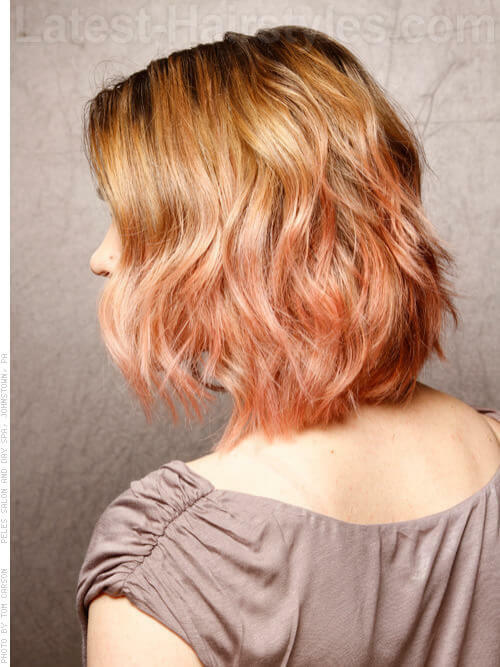 Try using chalk for a wash out color that adds fun just for today! You can find an assortment of colors at your local beauty supply store. 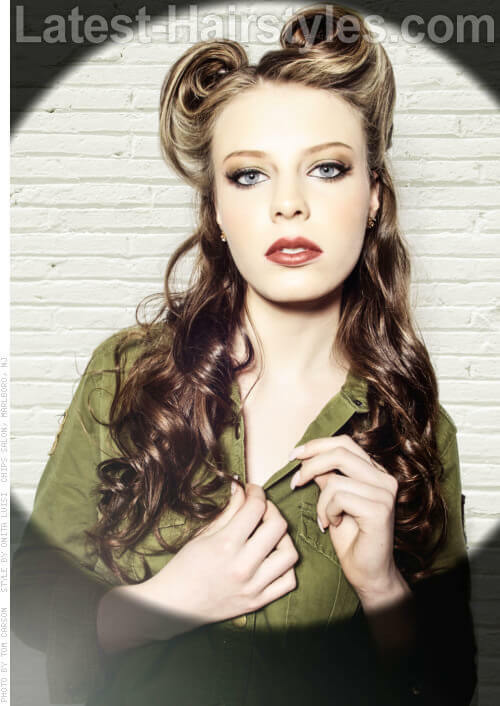 Striking victory rolls with imperfect curls updates this vintage classic for a fun look this summer. Starting with damp hair, apply a styling cream though out hair. Blow dry using a round or paddle brush. Once hair is completely dry, use both a 1-inch and 1½-inch curling iron, alternating curls to create a disheveled and imperfect look. Create a part and two sections in front. Brush hair down and starting at ends, begin to roll hair up towards the top and secure with bobby pins. Repeat with 2nd section. Make sure to spray both victory rolls with hairspray to keep them in place all night! Maintaining beautiful hair starts with your shampoo and conditioners. Using salon exclusive products will keep product buildup from forming and help to protect your color. Ask your stylist for their recommendation for your hair type. 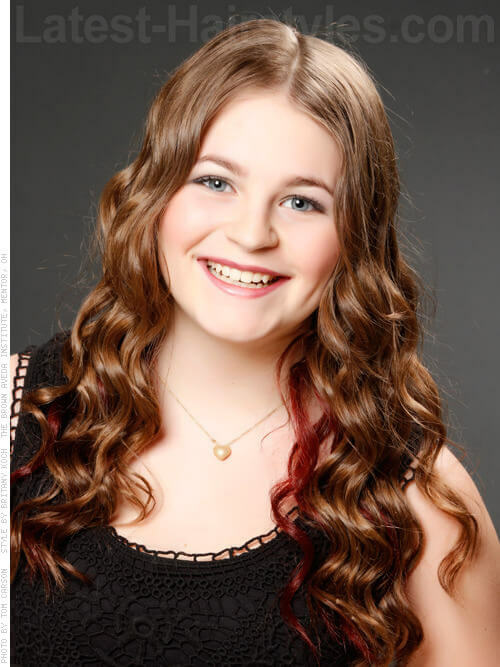 Oval and heart shaped faces are perfect for this style, while hair that is wavy to curly and medium to thick will help hold these imperfect curls all day. If your rolls are giving you trouble, you can use a small roller to help get it started. This look may be simple to achieve, but don’t underestimate the impact factor! These super straight locks show off a fabulous angled bob and braided bump. Apply a straightening cream to damp hair and comb through to ensure even saturation. Blow dry hair in sections using a flat brush. Make sure that your dryer is always blowing the air down your hair shaft towards the floor. This helps to control frizz. Once hair is completely dry, use your favorite flat iron set at the lowest temperature for your hair type (colored or highlighted hair should never be over 390 degrees). Mist hair with a heat protecting spray before flat ironing. Start underneath and move your way up the head. Split off a section in the front (about the size of thick bangs) to create a braided bump. Begin French braiding the section, but hold the braid away from the head a bit to create some height. Secure braid with clear elastic. If you still need more height to your bump, lightly pull at your braid, starting at the front. Pravana’s Relax Straightening Cream is my favorite! It’s heat activated, so if you need to touch it up after sleeping on it, just run your iron through and the kink or bend in your hair is gone! Heart and round face shapes wear this best, while hair that is wavy or straight and medium to thick will hold this style easily. Don’t get frustrated if your braided bump takes a few times to get it perfect. Just keep practicing and it will be a breeze! Sultry Curls with a Full Bodied Fringe. This look is a go to for a night out with the girls, wedding, or special date! A full bodied fringe and beautiful curls…what more could a girl want? While hair is damp, spray in a sea salt spray to give it hold and texture. Blow dry hair using a medium round brush, while switching to a flat brush for your fringe. Section hair into three parts — each side of your head and back. Secure with clips. Using a 1-inch curling iron, begin wrapping your hair around it, keeping it about three inches from your scalp. Continue through all sections, letting curls cool before maneuvering them. Mist with your favorite hairspray and start to finger through hair, breaking your curls up and softening them. Having hold and a bit of grit when curling your hair will hold the style and look great. I recommend Kevin Murphy Hair Resort Spray. To have a full dramatic fringe, I recommend a heart shaped face. Hair that is medium in thickness and texture will hold these sultry curls beautifully! Not sure about cutting a full fringe? Talk to your stylist. They can give you an honest recommendation for your hair, face shape, and lifestyle. You can always get a clip-in fringe (or bangs) from a beauty supply or retail outlet. Clip them in and see if you should cut some of your own! Fun waves, a side pony, and a braided headband? Yes please! This ultra feminine look is a great take on a 70’s classic. Apply a medium hold mousse to damp hair. Blow dry hair using a vent or round brush. Once dry, section hair into three sections — each side and back. Secure them with clips. Using a 1-inch curling wand, bring down two-inch wide sections of hair. Wrap one-inch pieces around the wand, watching to make sure your fingers don’t get too close! Direct some pieces towards your face, and some away. Once all hair has been curled, lightly comb over to desired side using your fingers. Secure hair using a clear elastic. To make this more interesting, you can leave out a piece of hair from the ponytail and wrap it around the elastic and secure with a bobby pin. Don’t worry about your front layers that fall out of the ponytail, this makes the look! 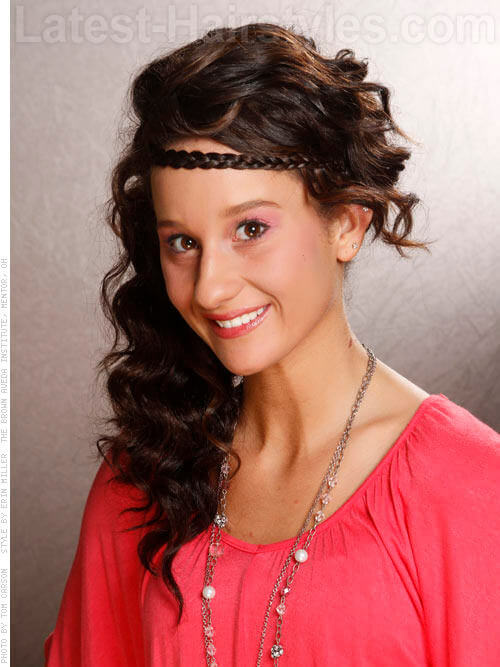 Add a braided headband or could use your own hair to braid and let drape over your forehead. A great mousse for hold, shine and volume is Pravana’s Elevate. Start with one pump of this lightweight mousse and work it through your hair. Any face shape can wear this fun look, while hair that is wavy to curly and medium thickness works best with these waves. Even if your hair isn’t layered, you can still rock this style. Pull hair over and into the side pony, then lightly tug on the top to loosen and give the appearance of shorter layers. This effortless wavy style screams summer fun! Have the look of just getting done with a day at the beach any day (even for work!). Add a few sprays of a sea salt hair texturizer to damp hair. Blow dry roughly, just using your hands. Once hair is dry, curl random pieces using a 1½-inch curling iron. When curling, place the curling iron midway down the hair shaft, twist around one to two times (depending on the length of your hair), and gently open the iron to “feed” the ends through the iron, using a sliding motion to pull iron out at the very ends. This creates the imperfect wave. Mist waves with sea salt spray again and give them a shake. 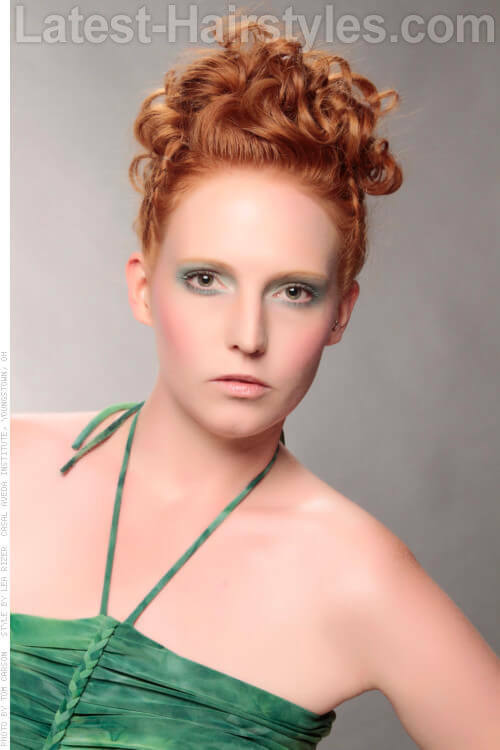 Kevin Murphy Beach Resort Texturing Spray is the ultimate product for creating this look! It can be used on both wet and dry hair. Heart, round, and oval face shapes wear beachy waves at this length nicely, while hair that is fine to medium in texture and has some natural wave works best. Love this fun pastel ombre color? 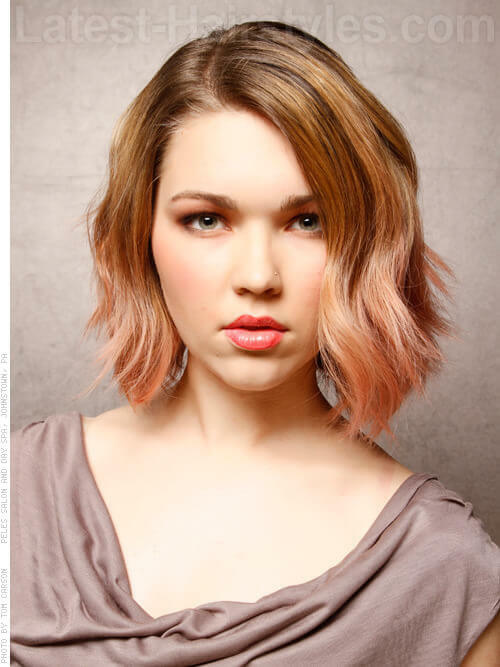 Ask your stylist at your next appointment for a soft transition with a rose color at the ends! If you want to try it just for the day, play with a hair chalk like Color Bug from Kevin Murphy that comes in multiple colors. This is one of the most versatile looks for summer. They are great for a day at your summer job, the beach, a bbq, or an evening date. This look goes with every outfit too! While hair is still damp, apply a styling cream. Comb through to ensure it covers all your hair. Blow hair dry using a medium round brush. Make sure to position the brush in your fringe area to sweep away from your face. Once hair is dry, section into three sections — each side and back of head. Bring down one-inch sections and curl using a 1-inch barrel curling iron. Let each curl cool before manipulating. As you move up through the sections and towards your crown, keep the curling iron three to four inches away from scalp. Once you have all your hair curled, use a smoothing oil to soften curls. Put a drop or two in your palm and rub together to activate product. Lightly run fingers through curls. Mist hair with your favorite hairspray to keep your locks curly all day. Not all smoothing oils are created equal! Try Pravana’s Nevo Hydra Pearls for a lightweight formula that will not build up, get greasy, or dry hair out. It creates a smooth, glass-like finish to your hair, all while helping the environment. Heart, oval, and round faces wear this look best, while hair that is wavy and medium thickness makes styling this look a breeze! If your curls keep turning out too “perfect,” try using a curling wand instead. Also, if you use bigger sections and keep the iron smaller, you get a more lived-in curl. This easy twist on a basic bun is hot this summer! It adds fun to any outfit and will keep you cool in the summer heat. Starting with dry hair, mist in a texture spray or dry shampoo. Create a deep side part and section it off to the opposite ear. Take another section in your crown and the hair left from the side part. Lift it up and back comb. For extra lift, try using a volumizing powder. When you achieve the amount of volume you desire, draw the hair together and secure with bobby pins. Add the remaining hair in the back of your head and twist to create a bun. Secure with bobby pins. Take the front section and, starting at the part, begin French braiding. Wrap ends of braid into a bun, and secure with bobby pins. Mist the braid and bun with hairspray and you are ready to go! Dry shampoos are great for second-day hair and also to add texture and volume to clean hair. Pravana’s Fresh adds volume and kills 99% of germs too! Any face shape can wear this easy style, while hair that is wavy or straight and meduim to thick makes this style easy. This look is great for second (or third) day hair. Work dry shampoo through all of your root area, brush through, then proceed with the step by step and no one will ever know! A middle part paired with perfect waves and a few bright highlights makes for some summer fun! Plus, it’s a look that looks great on almost everyone. While hair is damp, apply a medium hold gel and comb through. Blow dry hair using a medium or small round brush. Create a middle part, then section hair in three parts and secure with clips. Using a 1-inch curling wand, begin wrapping two-inch sections around the wand. Continue through the entire head, leaving two to three inches near the scalp straight. Once all hair is curled, put a few drops of oil in your hands and run fingers through curls to soften and break them up. Another one of my favorite products is Kevin Murphy Young Again Oil. You only need a drop and it creates a smooth, glass-like shine. Round, square, and oval faces look great in this wavy look, while hair that is wavy and medium in texture will style easily for you. When getting used to using a curling wand, be careful to not burn the tips of your fingers. Hold hair close, but not too close. Practice makes perfect! During summer, the weather gets warmer, the days get longer, and your hair can totally be styled different every day! Curls, braids, up, down or voluminous, these teen hairstyles for summer will have you turning heads all season long.